The highly successful and sophisticated German Marder entered active service in the early 1970's. It was designed under a concept that departed from previous armored personnel carriers, in that it is capable of offensive and defensive combat operations. It provides good protection to its load of infantrymen from small arms fire, and fallout from a tactical nuclear attack. Designed and developed by the Rheinstahl Henschel AG of Kassel, renowned for their formidable Tiger tanks of WWII, the Marder became such a distinctive armored vehicle, it was classed as a new category, and called the "MICV" or Mechanized Infantry Combat Vehicle with NATO forces. The development of the Marder dated back to the early 1960's when the first prototypes were built for evaluation. These closely resembled in appearance the HS30, then in service, and having a forward mounted turret. However the power-plant was moved to a right-side midship allowing a rear exit format for the infantrymen. Further improvements and a redesign made radical changes and re-positioned the power-plant to the right forward section. The last prototypes offered in the mid 1960's showed a sleek and sloped front section that provides excellent protection. It is powered by a Mercedes-Benz 6-cylinder diesel engine capable of 600h- that allows a maximum road speed of 75km/h. 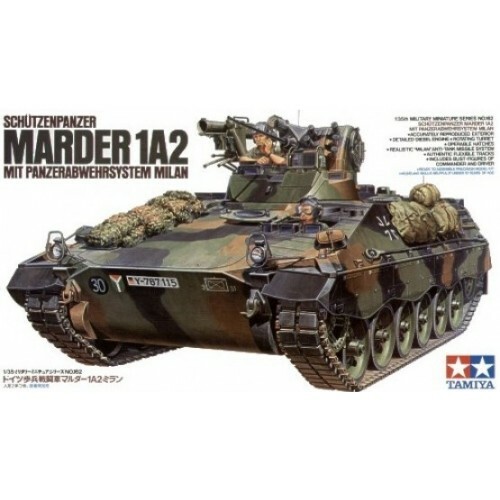 The Marder 1A2 is an upgraded version that features a "Milan" anti-tank missile system. The Marder, with 20 years in service, is continually being improved to meet the needs of NATO's long-term strategy.